It's time to shoot some things in space. I’ve been waiting for this one. You can’t browse for three feet on the internet without running into a retro game these days. These are the consequences, I’m afraid, for a generation of kids who grew up playing NES games that cost around $40-$50 a pop: you never got enough, and now with a multitude of free tools and talent, free retro platformers are everywhere. You can afford to be picky, to wait for the game with just the right mix of difficulty, nostalgia, and creativity to come around. 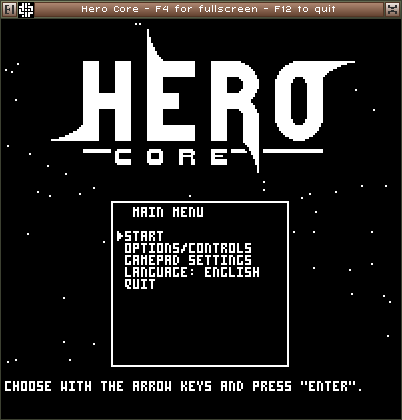 Hero Core has been worth waiting for. I won’t waste your time with too many words, you should probably start downloading it now. Gameplay is focused on exploration of a large world, with locked-off bits opening after periodic equipment upgrades, much like in the Metroid series. Your character controls like a fighter from a shoot-em-up: no jumping, you simply float around in the vacuum of the enemy lair, propelled by jets built into your suit.